When following dietary restrictions, especially more than one restriction at once, it can sometimes be difficult to maintain variety and nutritional diversity. That is why we have compiled two recipes, inspired by traditionally popular but inaccessible dishes, that do just that. Keep reading for recipes meant for people who are simultaneously vegetarian, soy-intolerant, gluten-intolerant, dairy-free, nightshade-intolerant, and rice friendly paleo. 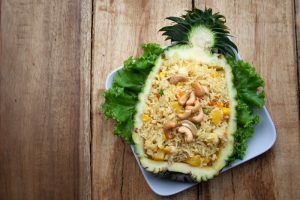 Eating paleo used to mean adhering to a strict set of rules which dictated no grains whatsoever, but the community has evolved to be more accepting of a few exceptions, including rice. Harnessing the health benefits of black, brown, or red rice, this fried rice dish proves itself worthy of the exception. You will need one cup of dry black, brown, or red rice (or a healthy portion of already-cooked rice), scallions (green onions), three cloves of garlic, ½ cup pineapple, coconut aminos (a soy-free soy sauce alternative), pink Himalayan or sea salt, 3 eggs, coconut oil, one half lime, cilantro or parsley, four leaves of kale, and a nut or seed, like chia seeds, flax seeds, or chopped cashews. Set rice boiling ahead of time in a pot, one-part rice, one part water. (Already-cooked and refrigerated rice works very well, too.) Wash the scallions, cutting the whites into disks and the greens into centimeter-long pieces and putting them into separate bowls. Cut up the garlic and put it in the bowl with the scallion whites. Wash the kale and cilantro or parsley, and chop the kale up into small pieces, putting it into a bowl with the scallion greens. Cut the pineapple into small chunks, and the lime in half. Start out by heating a medium-sized frying pan on medium heat, adding a spoonful of coconut oil, and then cracking the eggs into the pan. Stir with a fork until they resemble scrambled eggs and are cooked all the way through, and then set them aside in a bowl. Next, toss in the scallion whites and garlic, cooking for two minutes or until fragrant. Add the scallion greens and kale, then 1 Tbsp coconut aminos. Stir them together until the kale has wilted, toss in the pineapple, and add the cooked rice to the pan. Incorporate two spoonfuls of the nuts or seeds, if desired, and stir in the fried eggs. Salt to taste, continuing to fry until the rice begins to take on a drier texture, and remove from heat. Garnish with cilantro or parsley. 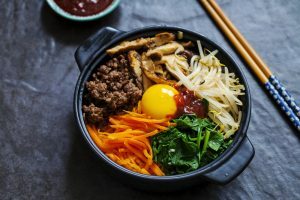 Bi Bim Bap, a beloved feature of traditional Korean cuisine, is ordinarily inaccessible to individuals who like to eat paleo, vegetarian, soy-free, gluten-free, and nightshade-free. But with some modifications, it can become more accessible. For each serving you will need one half cup of dry black, brown, or red rice (or a healthy portion of already-cooked rice), garlic, canola or sunflower oil, two eggs, two inches of daikon radish, one carrot, a napa cabbage leaf, two leaves of kale, scallions, sesame oil, sesame seeds, dried nori seaweed (unflavored), and possibly gochujang and sesame seeds. Gochujang, a Korean red pepper paste, comes from many different manufacturers with varying sensitivities to food intolerances, and it may be best to make your own. Avoid consuming gochujang if nightshade is intolerant, and if purchasing gochujang from an outside source, read the ingredients label to confirm your purchase is both gluten-free and soy-free. Sesame seeds are also a possible addition to this dish, but some manufacturers may expose the seeds to gluten, so read labels with care. Set the rice boiling (one-part rice, two parts water) if starting with dry rice. Next set to finely mincing the garlic, thoroughly washing and cutting the scallions into rings, and washing, peeling and then chopping the daikon radish and carrot into matchstick-size pieces. Wash the kale and cabbage leaf thoroughly and cut or shred them into smaller pieces. If the nori seaweed is in the form of sheets, use this time to fold one of the sheets over several times and slice it into small pieces. Place each of these ingredients in small receptacles and set them aside. To start, put a frying pan on a burner set to medium heat and add your canola or sunflower oil. (Using sesame oil would contribute to the flavor, but its low smoke point makes flavor-neutral canola or sunflower oil a safer choice.) One by one, fry the kale, scallions, cabbage, radish, and carrot for two minutes, incorporating the minced garlic with each vegetable and sprinkling in sesame seeds if desired. Place each vegetable back into its receptacle when finished; “bi bim bap” translates loosely as “mixed food,” and part of the experience is taking in the colors of the separate vegetables before mixing them together to eat them. Now, return to the rice, which may be done cooking. 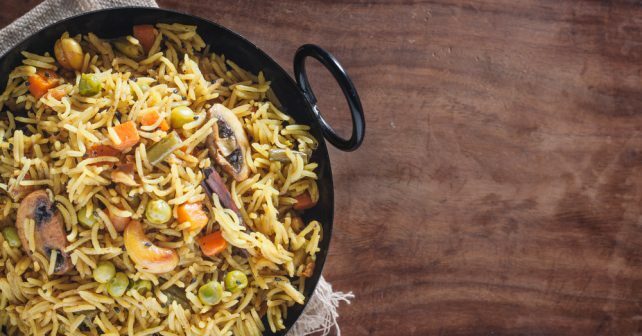 If reheating rice from another mealtime, now is the time to warm it in the frying pan. In either case, take a spoonful of sesame oil and a spoonful of rice vinegar and mix them in with the rice. Next, if using gochujang, spoon the paste into the center of the dish, where all of the vegetables meet. The paste is spicy, so take care to apply an amount compatible with your preference. Next, take the fried eggs and lay them carefully atop the rest of the ingredients. If desired, add sesame seeds as a garnish. Once this is all prepared, it is time to mix the ingredients together and enjoy the interaction of all of these flavors.